John Man was born in 1749 on Mansel Street, Whitechapel, Middlesex, the second son of John and Mary (Balchen) Man, and was baptized on 3 December 1749, at St. Mary Matfellon, Whitechapel High Street, Whitechapel. He married Sarah Baker on 5 June 1775 at St Mary the Virgin, Reading. 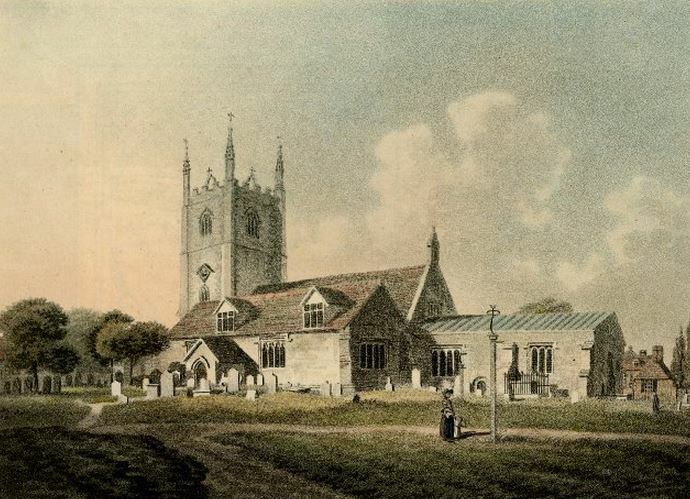 John died in April 1824 while residing on Castle Street, Reading, and was buried on 24 April at St. Mary the Virgin, Reading. Sarah Baker was born in 1739 or 1740 in Reading, the daughter of William and Jane (Cox) Baker, and was baptized on 25 February 1740 at St Mary, Reading. Sarah died on 8 May 1808 and was buried on 14 May at St Mary. It was once believed that there were no descendants from this branch of the family, however it has been discovered that William Man married very late in life and had a daughter. This daughter was found still living but unmarried at the age of 36 on the 1901 census. Like his brother Henry, John was educated by the Reverend John Lamb of Croydon and he then became a schoolmaster and author. John published a number of books, and some poems and letters which can be found on a separate page here. On hearing the news of John’s death his cousin Richard Dennison Cumberland comments in a letter to his brother George of his: ‘ … going to Reading to see poor Maria after the loss of her father … and to do something for his poor blind sister as you suggested I may once more see her …’ (see letter Add 36510f87). The question remains as to which of John’s two sisters, Ann or Frances, was blind? The last part of the extract might lead one to think that the sister might not live much longer. Ann died two years after John and perhaps she is the one to whom Richard Cumberland is referring. Sarah (Baker) Man’s death date is taken from the will of John and Sarah’s daughter Ann Maria. See also John’s two letters concerning the disappearance of his father John Man. The first is addressed to his brother James and the second to his cousin George Cumberland. 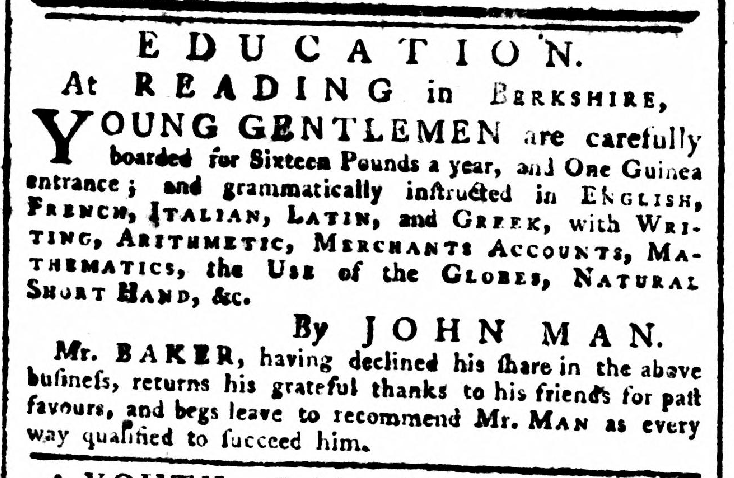 Both letters can be read on John father’s page. John is fondly remembered in the autobiography of the Reverend Thomas Frognall Dibdin (1776 – 1847) who was a pupil of John’s entitled Reminiscences of a Literary Life. When Thomas Frognal Dibdin published his book ‘The Bibliomania‘ in 1809, he sent a copy as a gift to his old schoolmaster and the following letter was written by John Man in response to that gift. (British Library MS 2974). This morning I received from Mr. Snare your very acceptable present, for which I beg you will accept my best thanks and congratulations on your so soon having brought it to publication. I have as yet only taken a peep at its contents just sufficient to convince me that in point of ornament and beauty of type it is superior to most; the literary art will I have no doubt afford me much pleasure in the reading for I am writing to confess though a first rate bibliomaniac it is long since I have sought anything more from books than pleasure, reading more for amusement than for intellectual improvement. The latter you will allow with me it is time to give up when a man has arrived at the age of 62 when it is too late to recover the past or lay a foundation for future knowledge in a very few years if not days to be committed to the grave with the professor. As I have always considered you one of my family it is very natural I should take a pleasure at the success of your endeavour to instruct and improve posterity, for I am much mistaken if the name of Dibden will not be as well known in the centuries to come as in the present. Being as you know, a very modest old fellow and consequently unwilling to intrude myself on Mr Bere I commissioned our friend Frank, or rather our frank friend to request the favour of you to make our best thanks to that gentleman and his lady for their present which was a great treat to us all. What only we had to regret was the disappointment in not having the young gentleman to partake of it but more so the cause which denied us his company. From what you say I am fearful that his commission was never executed and as my silence must place me in an unfavourable light with that gentleman I beg you will do your best to set the matter in its true light and make the best apology for me you can. [On the back Dibdin has written]: My old schoolmaster at Reading with whom I was placed at five years of age when I arrived from India. 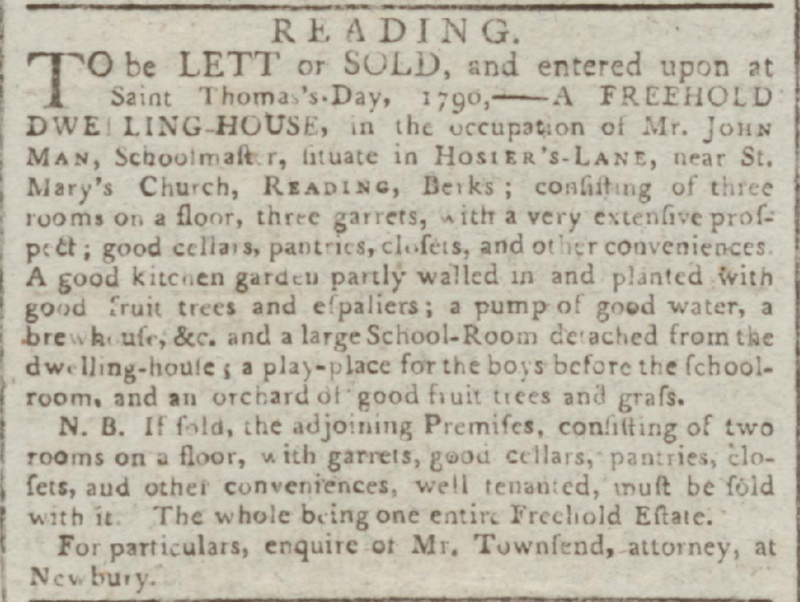 This notice that appeared in the Reading Mercury date Jun 1795 indicates that John relinquished his role a schoolmaster and handed over his school to James Taylor who a year later married John’s sister Maria. The following letter by John’s son William Man to his cousin George Cumberland describes the circumstances of his father’s death. ADD 36510 f 78 William Man to George Cumberland. of Castle Street in the Borough of Reading in the County of Berks. That is to say, I Give to my Son William Man all that my Freehold Estate situated in Castle Street in the Borough aforesaid, now let to Miss Welch, with the appertinances thereunto belonging to keep or dispose of the same in what way he pleases. I Give to my Daughter Maria Man all that my adjoining Freehold house, now let to Peter Pineau, Esqrewith the appurtenances thereto belonging to keep or dispose of the same in whatever manner she may hereafter please. And to prevent as far as possible future disputes, my will is that the partition Wall and fence between the two Gardens should be considered as annexed and a part of the same House hereby bequeathed to my Son William and my Will further is that the Pump shall remain common to both houses and be repaired at their joint expense and that the Writings be kept by William Man subject to the inspection of his Sister or whoever she may appoint. I also Give to my Daughter Maria Man all that my Freehold tenement wherein I now reside situated in Castle Street aforesaid and adjoining the above mentioned Freeholds with the appurtinances thereto belonging with the same right of disposal as above mentioned in respect to the adjoining house hereby devised to her. I Give to my Son William Man and my Daughter Maria Man the Six Cottages I built at the North end of my premises to hold the same jointly and the rents arising therefrom to be equally divided between them with the same right of disposal thereof as above mentioned. 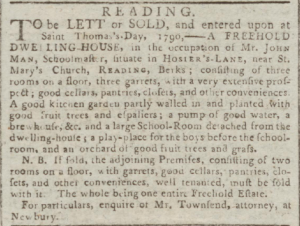 I Likewise Give to them jointly all that my Freehold Estate situated at Binfield in the Count of Berks, and now let to Mr Charles Cove together with the Coppice I hold in my own hands and also two acres and a quarter of newly inclosed land, now let to Roberts, together with the rights and appurtenances thereto belonging. And my meaning is not to entail the above freehold estates but to leave to my Son and Daughter the same right to dispose of them as I myself possess. But in respect of the last two mentioned Estates, that is to say, the six Cottages and the Binfield Estate neither shall dispose of his or her moiety without the consent of the other, and as long as they retain them undisposed of, the rents and profits to be divided between them share and share alike. I Give to my two Nieces Emma and Ann Man each the sum of five pounds and the like sum of five pounds to my Niece Thomasina Baker. And whereas I have during my life time by Deed of Gift disposed of all my personal property, that is to say, all my household furniture, plate, linen, etc. to my Daughter and all my Books, Instruments and everything not included in the former Gift to my Son, my Will is that each of them do, out of the first proceeds of the Estates hereby devised to them, pay and discharge in equal moieties all my remaining Debts, Funeral expences and the expence of proving this my Will. And I hereby leave them Executors of this my Will, signed in the bottom of the first leaf with my name and this last with my hand and seal this 28th day of May 1822. William Mann and Maria Mann the Executors in this Will named were sworn to the truth thereof and as usual and also that the Effects are under £20 in value. This Will was proved in the Visitation at Reading on the 9th day of June in the year of our Lord 1824 before the Reverend Thomas Edmund Williams, Clerk, D.D., Surrogate of the Reverend Richard Francis Onslow, Clerk, Master of Arts, Official Principal of the Reverend the Archdeacon of Berks lawfully constituted by the Oaths of William Man and Maria Man, Spinster, the Son and Daughter and Executor and Executrix therein named to whom Adm con was granted being first sworn duly to administer. 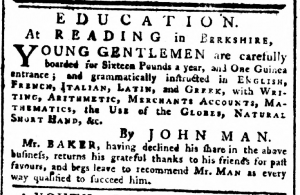 We do not know what John Man’s contribution was except that in the section on Berkshire there is a passage on the town of Reading which may have been his. As for his cousin, George Cumberland, he lived for a time at Windsor and he may have contributed on that town. The section on Berkshire can be read HERE. Wallis (Dr. John) Collection of Letters and other papers intercepted in cypher during the late warres in England, decyphered by John Wallis, sm. 4vo. neatly written MS. transcribed from Wallis’ own MS. in the Bodleian library, with his portrait engraved by Loggan inserted, hf. bd. 2. 10s Transcribed by John Man, 1786 The letters are preceded by an interesting account of the life of Dr. Wallis, by John Man, dated 1786. 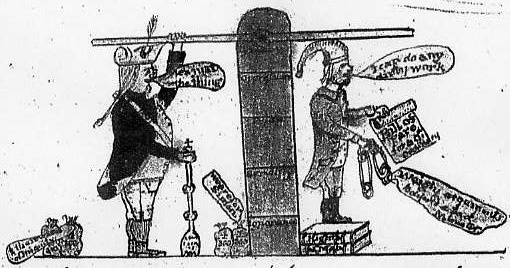 Man’s name is known through his printed History of Reading. A biographical sketch of Wallis can be found right at the very end of this page. Wallis also appears in the DNB. iii) An entry from the Berkshire Ashmolean Society May 24, 1841 is as follows: “The History and Antiquities of Wallingford” from an unpublished MS by John Man (author of the History of Reading), in the collection of John Richards, jun. esq. F.S.A.” to be edited, with additions, by Richard H. Allnatt, M.D. Man, in his brief manuscript, considers that the writer in the minute-book must have been under a mistake, because, as he states, there is no mention of any such inducement on the part of the monarch in the charter. But the mistake appears to rest with the author of the manuscript, who, it would seem, had access only to an imperfect translation of, or to an extract from, the charter, in which the recital in question did not appear. All the above quotes are from Hedge’s ‘History of Wallingford’ and include an explanation as to why John Man’s short manuscript never appeared in print. However Hedges himself is quoting from some version of Man’s manuscript which appears to have been owned by Nichols. Onr wonders what happened to it. Title: Rambles in the neighbourhood of Wallingford also some account relative to its ancient, medieval, and modern conditions by William Allnatt Publication: Wallingford : Printed and published by S Bradford, Year: 1873 100 p. ; 19 cm. This publication appears 32 years after the entry about the Berkshire Ashmolean Society and Richard Allnatt’s attempt to publish a history of Wallingford based on Man’s manuscript, maybe. William Allnatt was a son of Richard’s and he completed his father’s work. If so, did he acknowledge John Man’s contribution? In A History of the County of Berkshire: Volume 3. Originally published by Victoria County History, London, 1923. 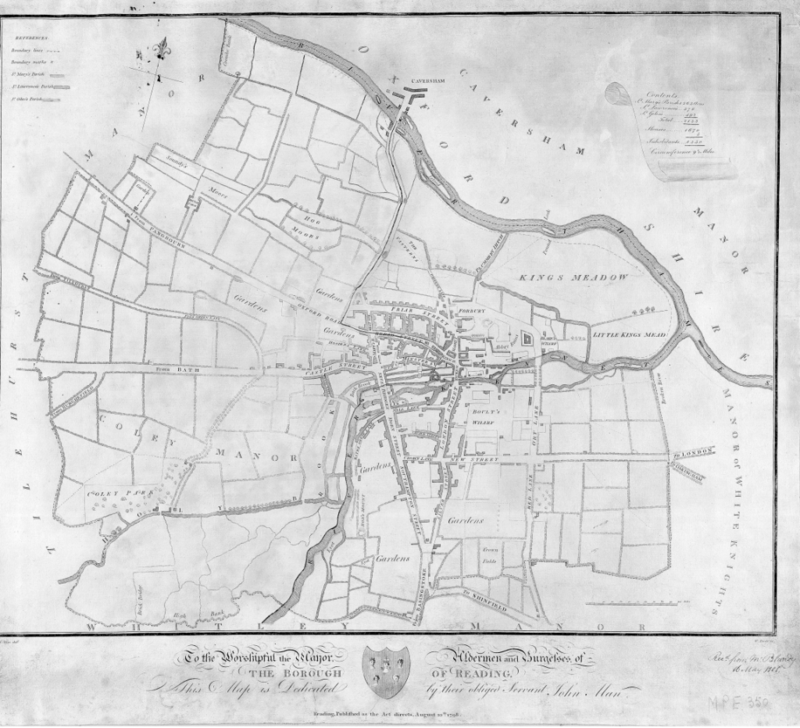 There is a chapter titeld ‘The borough of Wallingford: Introduction and Castle’. Cited in MS. Antiquities of Wallingford, 28, 29, by Richard Skermer, M.A., written 1712–16, in which year he died (Hedges, Hist. of Wallingford, ii, 407). Of this and also of John Man’s MS. 1818 (ibid. 398) some pages were printed for the Berkshire Ashmolean Society, 1842, but never published (ibid. i, 205). The references are to a copy of pp. 9–32 of Skermer’s MS. and 41–64 of Man’s in possession of the Rev. J. E. Field. The ownership of the original MSS. has not been traced. He inherited from his father-in-law William Baker, a small school. John’s brother in law, William Baker, achieved prominence as printer; for details see the Baker Family. 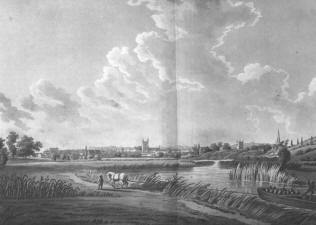 Above is a view of Reading at the end of the eighteenth century.